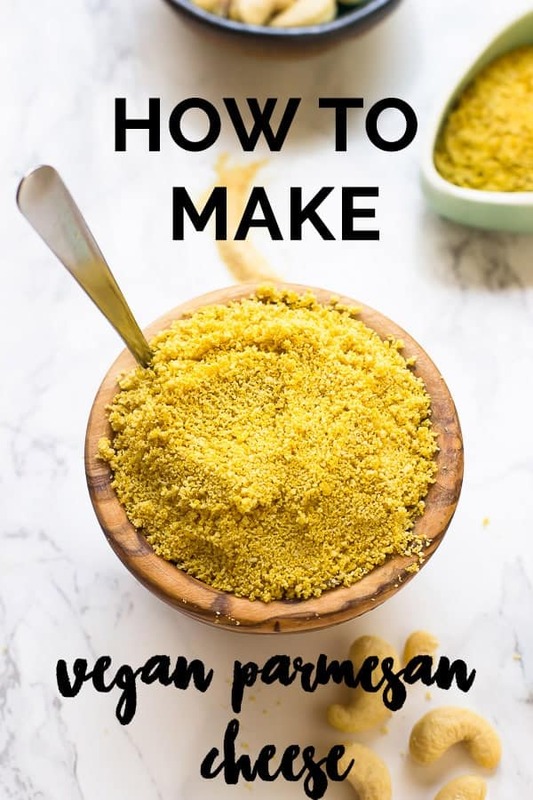 Learn how to make Vegan Parmesan Cheese with just 5 ingredients in just 5 minutes! 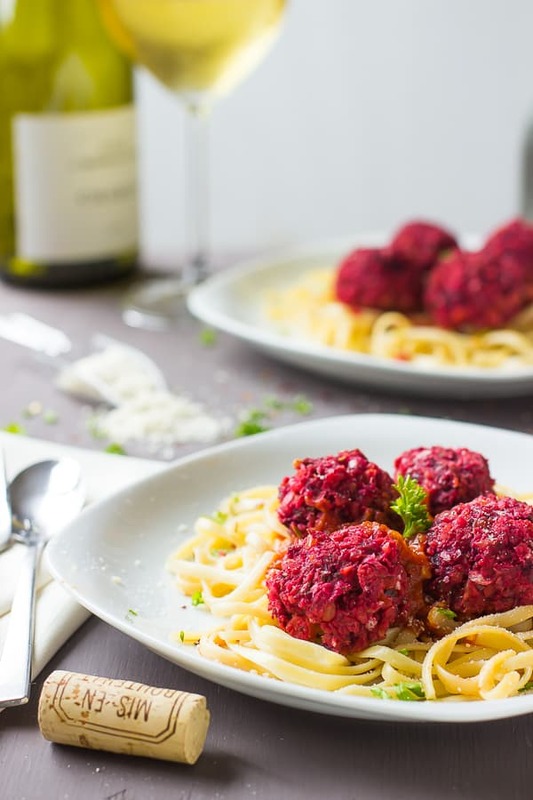 Quick, easy and tastes AMAZING! Without a doubt, I was a member of parmesan cheese addicts anonymous, PCAA for short. It goes great with pretty much everything on earth, but I had finally reached a point where I NEEDED a vegan alternative. In walks in 5 super single ingredients: cashews, nutritional yeast, sea salt, garlic powder, and the one that made all the difference, onion powder. 5 minutes, a lifetime of happiness, and vegan pizzas. So, how and why does this taste like parmesan cheese? If you’ve ever made cashew butter, then you know that it grinds down into a meal similar to almond meal before turning into its gooey butter goodness. That meal directly mimics parmesan cheese in both texture and consistency. The cashew meal provides the perfect base to add nutritional yeast. 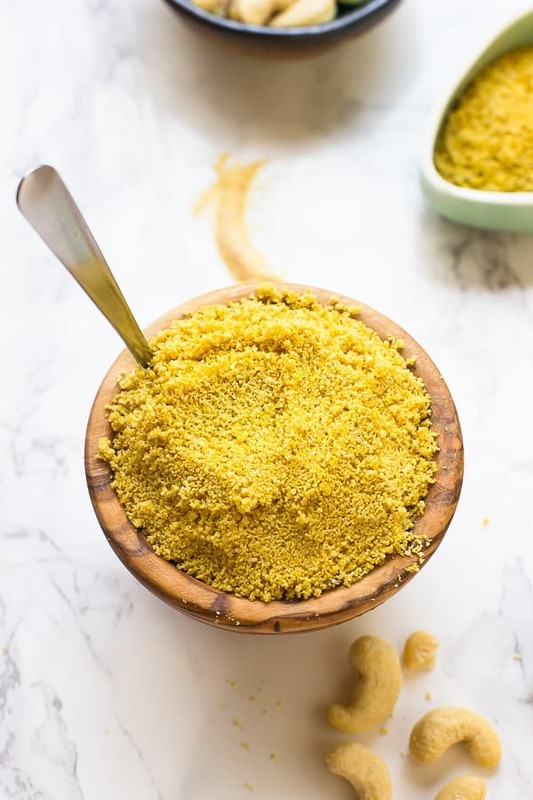 Nutritional yeast is THE vegan go to for cheese-like flavour and has tons of B12 making it delicious and essential. Then the other three, garlic powder, onion powder, and sea salt balance out each other with flavour, slight saltiness, and an extra hint of cheesiness. All in all, they go PERFECTLY together to make vegan parmesan cheese. Plus, I love making this at home because it’s way cheaper than buying it in the store. Using unsalted cashews is necessary. Salted cashews will alter the taste and consistency of the product. You can substitute the cashews for another skinless seed such as sunflower seeds to make it nut free or macadamia nuts, but I can’t guarantee the exact same consistency. Don’t pulse it don’t too much else it would begin to turn into a slight paste because of the cashews. 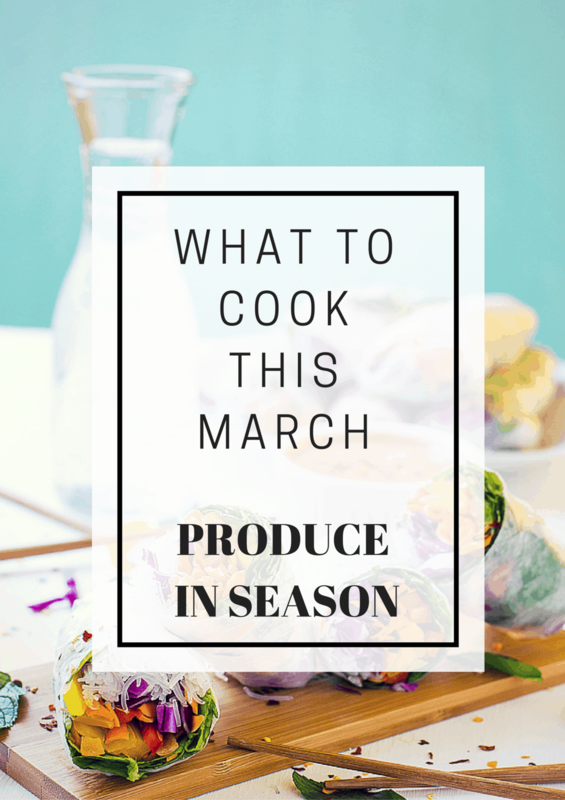 Just pulse until everything has come together in your food processor. You can double or triple this batch if you’d like! In a food processor, add the cashews and blend until they became ground down into a meal. Add all the other ingredients and mix together until combined. This vegan parmesan cheese should be stored in an airtight jar in your fridge. It will last up to 2 months. This is SO cool. I’m definitely trying to eat more whole foods, this looks like a great one to try! I’m vegan and have never had vegan parmesan cheese. I will definitely give this a try! This is super cool! I can’t have a lot of dairy these days at all so I most definitely need to try this out!! Same with me and the dairy! Thanks Ashley! Wonderful recipe, looks absolutely fabulous. Can’t wait to try it soon!! That’s just super cool! I can’t wait to give it a try too. Thanks Angie! 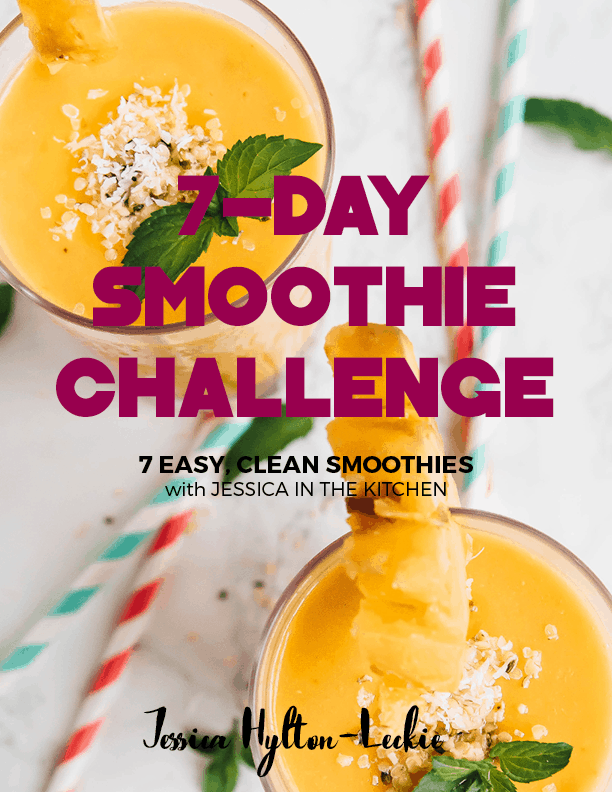 You really should – so easy and delicious! 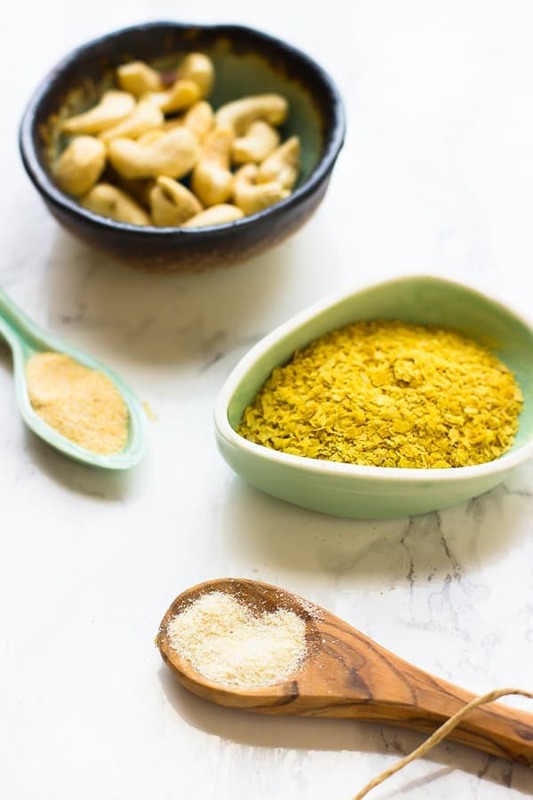 I love nutritional yeast and find a way to use it almost every day. What a great idea to use it to make vegan Parm! Hi Jessica! I’m not a vegan, but this post really intrigued me. I’m amazed that you can make parmesan in this way! Thanks Helen! Yes, it’s crazy how easy it is to make and how great it tastes!! I am a total cheese person but you totally have me wanting to try this! I can just imagine how it would taste exactly like parm- maybe even better! Genius. Thanks Allie! Seriously, I can’t tell the difference!! Which is insane since I am a cheese addict! This looks awesome and Id love to try it. But, do you have any suggestions as to where i can get nutritional yeast in Jamaica? Sorry that I’m just seeing this! You can buy it at the Natural Health Store in Orchid Village. 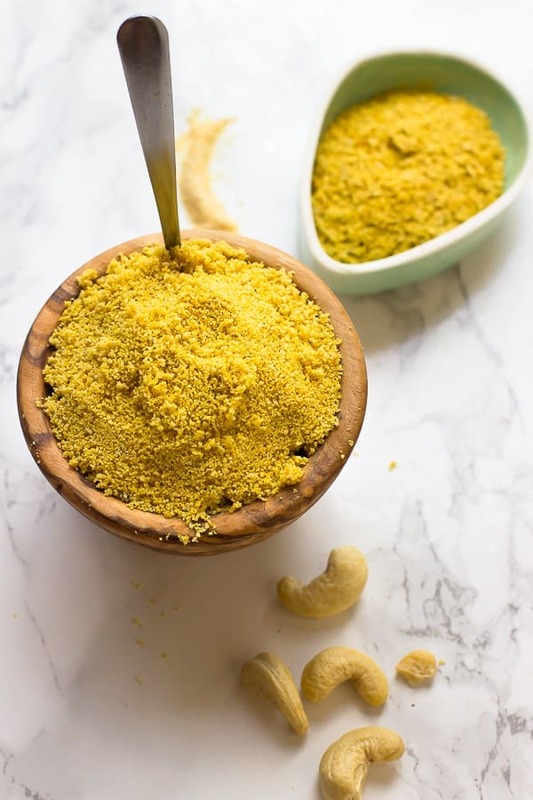 It’s hard to believe that buying the cashews and nutritional yeast, would actually be cheaper than buying Parm cheese – but then I have never priced the vegan Parm cheese! Yeah, way cheaper to make at home than store-bought vegan parmesan cheese! My daughters both have a yeast allergy. Can you think of a substitute for the yeast? Holy cow! I had my doubts, but this could not be easier to make or more delicious. I’d even say it tastes way better than Parmesan. I’m using it to top on a baked rice and butternut squash casserole, which is now, thanks to you, 100% Vegan. Yay! Thank you! Hey Betsy!! Aww wow this makes me sooo happy!! You’re so welcome and thanks so much for your comment!! Great and easy recipe! Thanks for the share. Thanks so much Daniel and you’re so welcome!! I just made this parmesan cheese to sprinkle over my vegan pizza. It looks great. Can’t wait to taste it. Thank you so much for this easy recipe. So happy to hear you enjoyed so much!! You’re so very welcome and thanks for your feedback!